About a month ago, a Galaxy Zoo contributor named Bruno discovered a very unique galaxy merger in the Sloan Digital Sky Survey data. The merger appeared to be a triple, or possibly quadruple system, which are indeed quite rare, and it includes curiously thin and long tidal tails. The Galaxy Zoo team has been informally referring to this merger as the Violin Clef or the Integral based on the unique shape as shown above. Based on Brunos curious discovery, the Galaxy Zoo team put in significant efforts to learn more about this merger. Galaxy Zoo team member Kyle Willett provided an update this week, highlighting several new insights, along with more information on this mergers significance. One of the additional reasons the system is of scientific interest is that while merging galaxies are quite common in our universe, the merging process is fairly quick compared to the lifetime of a galaxy. What is not common is to observe a system with long tails and multiple companions, which gives researchers an opportunity to test their models of galaxy interaction against a system caught in the act. Researchers are also interested in the content of galaxies and their tails  specifically the gas and stars. In most mergers, there is a compression of gas by gravity, which leads to a short burst of new star formation in the galaxies and their tails. The resulting star formation results in young, hot stars which are typically blue. (Note: Younger hotter stars are bluer and older, colder stars are redder). What is odd about the Violin Clef merger is that all four galaxies and the tidal tails are red. Once researchers have a distance estimate, they can study UV and radio flux data and determine an estimate of the total star formation rate. Additionally, if researchers have very accurate data from light received (spectroscopy), its possible to measure the relative velocities of each interacting galaxy, and build a sort of 3-D picture of how the four galaxies are interacting. 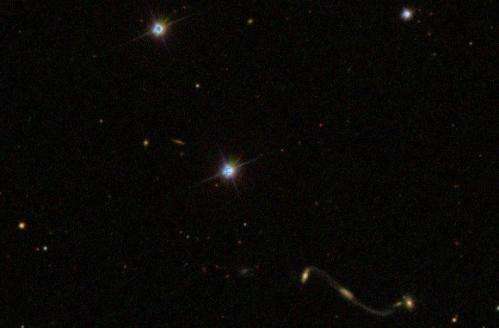 Since there wasnt any existing spectral analysis data of the merger system, Danielle Berg, a graduate student at the University of Minnesota, observed the Violin Clef in September using the 6.5-meter Multiple Mirror Telescope in Arizona and provided the additional data needed to answer some of the questions the Galaxy Zoo team had about the system. Based on these recent discoveries, the Galaxy Zoo team is putting out a second call for assistance on analyzing the Violin Clef merger. According to the team, the next step in the analysis will be working with simulations like the ones in Merger Zoo. Now that the team has confirmed the Violin Clef is almost certainly a quadruple merger, the number of merger models that need to be ran is reduced.